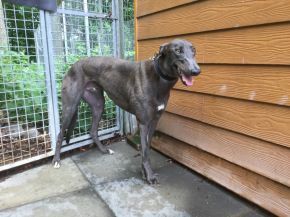 GEORGE is a lovable big blue male greyhound. He is generally a docile sweet boy but he does get very excited initially when he knows that he is going outdoors. He quickly calms down and he walks very well on lead without pulling, both when walking on his own or with a doggie companion. He gets on well with other greyhounds and he doesn’t cause a fuss. He does need some house training but I'm certain that this can easily be done through a regular toilet routine when he is settling into his new home. He really is a very nice boy and he likes to please you. He would bring such love and happiness to his new family.